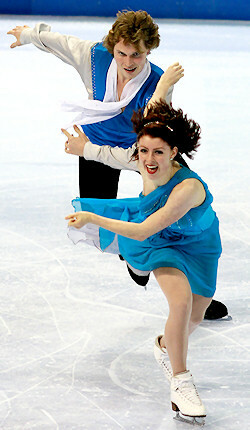 Nicole Orford and Thomas Williams win the Junior Ice Dance title at the 2011 BMO Junior Canadian Figure Skating Championships. With their strongest skate yet and a new personal best, Nicole Orford and Thomas Williams (BC/YT) were named junior dance champions of Canada on Thursday night in Victoria, B.C. Their fast, smooth free dance, set to strings arrangements of popular songs, earned 75.81 points en route to a total score of 130.31. Orford and Williams hit all their goal levels in their program—fours on everything besides footwork, which both earned level threes—and fantastic Grades of Execution (GOE). Two single base marks of zero were awarded during the program, with every other mark being a +1 or +2. The duo has come a long way in a very short time. Only skating together for eight months, Orford and Williams originally only hoped to earn one international assignment. After they medaled at the JGP in Sheffield, England, however, they had to reassess their season goals and were thrilled to stand on the top of the podium. With the addition of Orford and Williams’ gold medal, their coaches Megan Wing and Aaron Lowe have national champions this year at the pre-novice, novice, and junior levels. With 123.20 points, Kelly Oliveira and Jordan Hockley (CO) were thrilled with their silver-medal-winning effort. Their Singin’ in the Rain free dance was also their best skate of the season, scoring 71.24 points. Oliveira and Hockley also earned level three for both footwork sequences, and level four for most of the remaining elements. Their twizzles, however, got called a level three, which set them back a point. Very strong elements meant that they received mostly +1 GOE marks, and their performance level was spot-on. Always known for being entertaining, the team had an absolute blast during their skate and stood on the podium for a second year in a row. Last year, they were the novice champions of Canada. Less than a point from second, Victoria Hasegawa and Connor Hasegawa (QC) took the bronze medal with a total score of 122.86. The Hasegawa siblings were another team who entered the season without huge expectations, and were delighted with how well their competition went this week. Their Stairway to Heaven free dance is carried over from last year, and they skated the program with confidence and precision. Earning the same levels as Orford and Williams, the Hasegawas’ also passed the 70-point benchmark with 70.98 points for their free. They were also bronze medalists last year, but on the novice level. Although 95 percent of Andréanne Poulin and Marc-André Servant’s Somewhere in Time free dance was enchanting, their one major mistake—a fall from Servant on the twizzles—resulted in a heartbreaking fourth place. Struggles with the twizzles have plagued the duo all season, and unfortunately, the element got the best of them again this time. After the twizzles, however, they recovered beautifully and were right back into the program. The team even earned an elusive level four for their circular step sequence, something they have been striving for all season. With 118.04, they scored a season’s best overall and earned 67.33 points for their fourth-ranked free dance. Their fourth-place ranking is up one place from last year. Elisabeth Paradis and François-Xavier Ouellette (QC) moved up from sixth to fifth with a saucy free dance to a jazzy rendition of Bei Mir Bist du Schoen. Scoring 67.28 points in the free dance, they finished the competition with 114.64 points, just edging past Laurence Fournier-Beaudry and Yoan Breton (QC). Paradis and Ouellette scored big GOE for their fantastic lifts, but only earned a level two for their final rotational lift. They are a new partnership this season. Paradis finished 14th at this event last year while Ouellette was 13th.